I generally don’t like complaints. I always believed that complaints are what weak people do. Strong people don’t complain. I like to think about solutions rather than complaining about my problems and situations. If I cannot fix my problems, I just have to accept them and live with them rather than complaining about them. I don’t like to complain about things. Until I see that a problem can be fixed and it can be solved or when I see that is impossible to do so, I don’t see it anymore because that becomes a complaint. I just live with it. I just accept it rather than trying to change it. I don’t think God likes complainers either. The biggest problem of the Israelites, in the wilderness was their complaints. They constantly complained about everything. One after another. When they faced the Red Sea in front of them, they thought that they would die. Who would see any solution there? So when they saw the Red Sea, this is what they said: “Was it because there were no graves in Egypt that you have taken us away to die in the wilderness? What have you done to us, bringing us out of Egypt? Is this not the very thing we told you in Egypt, “Let us alone and let us serve the Egyptians”? For it would have been better for us to serve the Egyptians than to die in the wilderness.” (Exodus 14: 11-12). I mean they knew that there was no solution. They knew the Moses could not do anything about it, but they complained. Then God opened the water and let them go through. Then in the wilderness, they didn’t have food. Now this is what they said. “If only we had died by the hand of the Lord in the land of Egypt, when we sat by the fleshpots and ate our fill of bread; for you have brought us out into this wilderness to kill this whole assembly with hunger.” (Exodus 16:3). Again, complaint. They experienced the Red Sea, but a smaller problem occurred and they complained not only twice, but whenever they had problems. 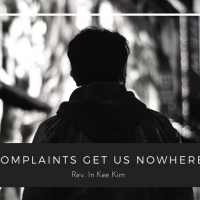 Their way of dealing with their problems was complaining and in today’s these scripture, we hear their last complaints. The people spoke against God and against Moses. “Why have you brought us up out of Egypt to die in the wilderness for there is no food and no water, and we detest this miserable food” (Numbers 21:5). The last sentence, ‘we detest this miserable food’. What is that? This miserable food. That miserable food is mana. It was God’s Grace. God rained down mana because they were complaining about food— that they had nothing to eat. Eating the same food every day, they got sick of it. It’s kind of understandable. You don’t want to eat the same food twice in a day. If you have a sandwich for lunch, you don’t want a sandwich for dinner. You want to have jjajangmyun or jjampong or something else, but they ate this miserable food for how many years? Morning, lunch, dinner. They just ate this thing. When I went to South Africa, their meal was congee in the mornings. Oh, that’s not bad. Lunch, a little thicker. Dinner, same thing, but little with a little of piece of the sardine and then this morning, again. The same food every day. So I was kind of sick of it. It’s understandable eating manna everyday for how many years. But my friends, this is a wilderness. Think about it, what could Moses do? Could he make any other food? Did he have any solution? Didn’t they know that there was absolutely nothing Moses could do? Be reasonable! But they complained. Sometimes complaining is not reasonable. It’s a habit. It is a spiritual habit. Complaints get us nowhere. That’s what I learned. Complaints get us nowhere. Be careful. Complaints can be habitual and not a very good habit. Don’t take that habit. Complaints can also bring disaster to us. That was what happened. So many people got bitten by a poisonous snakes. The complaints about food immediately disappeared because they had a bigger problem. Because of poisonous snakes, they were about to about to perish. When we complain about small problems, we may sometimes face bigger problems, so be careful. I think there’s a difference between complaints and critical thinking. Complaints come out of emotional explosion. Critical thinking comes from deep, careful thinking. Complaints are spontaneous reactions, but critical thinking is for the future. Complaints come from self centered thinking and are therefore very subjective. Critical thinking considers everything and therefore there is a good balance between subjective and objective thinking. Complaints always make scapegoats and target them. In today’s scripture, the Israelites scapegoated Moses and even God. Critical thinking involves oneself in his critique. Complaints bring misunderstanding and division. Critical thinking brings understanding and unity. Complaints destroy the community. Critical thinking leads the community for the better future. Critical thinking is a good thing. I don’t like complaints, but I appreciate critical thinking. The Israelites repented, and came to Moses for help. This was what they said, “We have sinned by speaking against the Lord and against you; pray to the Lord to take away the serpents from us” (Numbers 21:7). So Moses prayed for the people. In his prayer he got this message; God told him to make a serpent of bronze and put it on a pole and let people look at the serpent and they’ll be healed. The serpent was their problem. Poisonous snakes were their problem. God told them to gaze on their problems. Don’t be scared. Don’t run away from your problems, look at your problems, but remember, it is God who will help you with your problems. Looking at the serpent was nothing. God didn’t tell them to find some kind of herbs and then put it on your wound and whatever. No, just look at the serpents, but remember, it is God who will heal you. It is the Lord your God who will save you. Jesus used this example in this teaching. This was what Jesus said, and just as Moses lifted up the serpent in the wilderness, so must the son of man be lifted up. Jesus used this incident to talk about Jesus. A Roman Centurion just looked at the cross and saw Jesus and he was healed. He was able to confess that truly this was the son of God. He did nothing to understand that he just looked and understood that that was the Son of God. Salvation is not something I do. Salvation is what God does. It is God’s grace. Don’t create self salvation for yourself. You can never save yourself, even with your religiosity. You cannot save yourself. I cannot create salvation for myself. God made salvation possible. Instead of complaining, the Israelites should have trusted God. God would have taken care of their needs. Don’t be slaves to your complaints, but look to God and be free from the lifestyle of complaints. If you don’t do that, your life will be constantly complaining one thing after another and your life will not be there anymore. You’re not going to be a happy person. You’ll be a very miserable person by doing that, by keep on doing that. There’s an interesting story about this later in the scripture. It is from 2 Kings 18:4. It is about king Hezekiah. “He removed the high places, broke down the pillars, and cut down the sacred pole. He broke in pieces the bronze serpent that Moses had made, for until those days the people of Israel had made offerings to it; it was called Nehushtan.” (2 Kings 18:4). It’s very interesting. God told Moses to make bronze serpent and if people saw the bronze serpent and the got healed and this time Hezekiah broke down and destroyed the bronze serpent. Why in the wilderness did God want to teach the Israelites to look to God through bronze serpent? God wanted them to realize that it was God who saved them, but after many years, they made a bronze serpent and they believed that this bronze serpent had power to save them. In other words, they started worshiping this bronze serpent rather than looking to God. Cross yourself does not have power. It is God who works behind the cross. That has power. When you look at Hollywood horror movie and then the priest comes out with a cross and then people are frightened; the cross doesn’t have power. That’s a myth. That’s a superstition. It is God who works behind the cross. The bronze serpent only pointed to the living God who saved them. It’s like I explained a few times here. It’s like that finger that points to the moon. What is important is the moon, not the fingers by looking at fingers, you can never see the moon. You have to see what the fingers point to. They just looked at the bronze serpent, but the serpent does not have power. God behind the bronze serpent does. Church itself does not have power. ‘Just coming to the church, you will become better.’ No, you won’t. You won’t be saved by coming to church if you don’t meet God personally in your life, there is no salvation in that. Just becoming a member of St Timothy or any church will not give you salvation. You have to meet God personally and look to God then salvation is possible. Legalism is only to see the law without God. Activism is to only see our action without God. Pietism is only to see your own belief without God. Fanaticism is to see only your own personal spiritual experiences without God. Asceticism is to see only discipline without God. Traditionalism is to see only the tradition without God. What is important is to meet God. When we truly meet God, everything changes. We will experience true healing, freedom and liberation. Look to God. Your complaints will disappear. Your complaints, my friends, have no basis, no ground. It is you. Don’t think that you have valid reason to complain many times. It is you. It is your spiritual problem. We complain because we are scared. Don’t be scared. Look to God. You can deal with your problems.